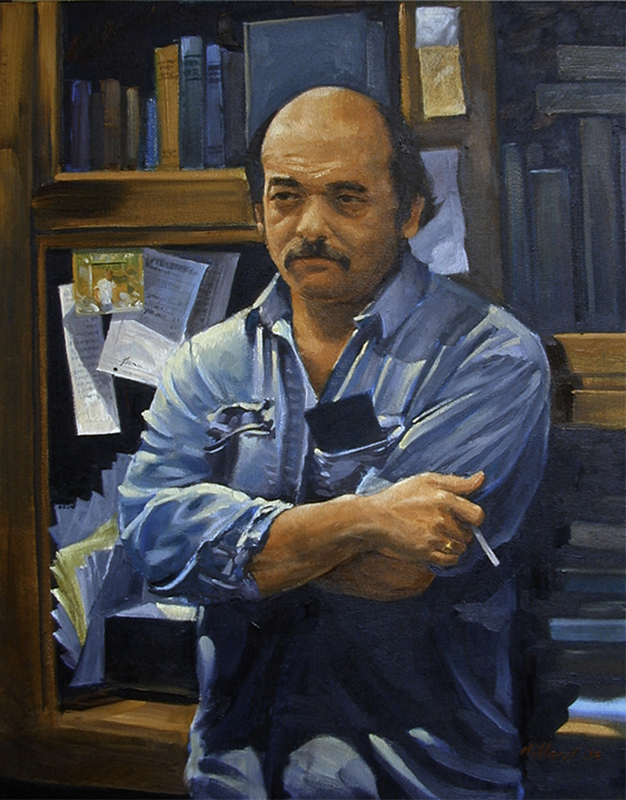 Through a selection of his artwork and their accompanying anecdotes, portrait artist Dennis Millard provides a glimpse into his art and the place and people that inspire him. 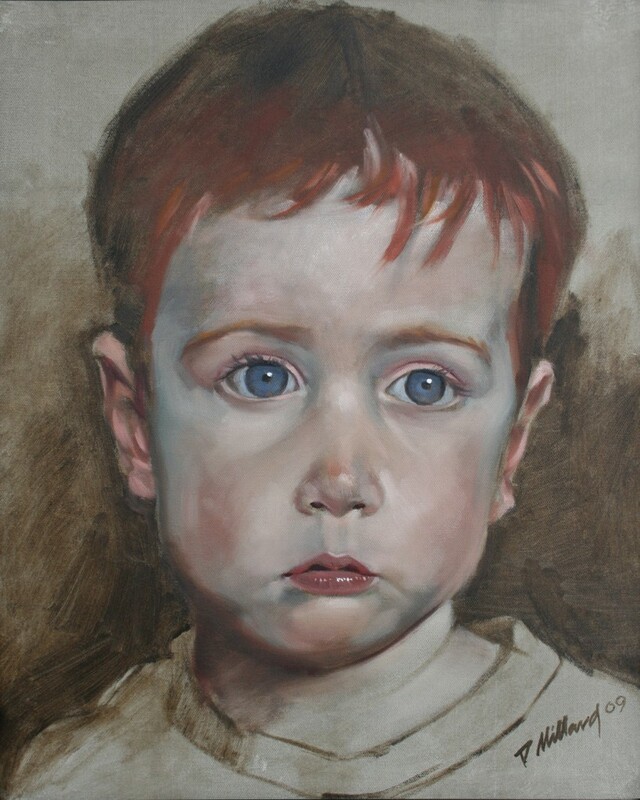 Why I paint portraits? I am attracted to portraiture because of the features and personality of a face. When I find an interesting face, I often discover they have qualities I want to paint. I like to meet with them at their home or in their office and visit with them. This helps me see who they are, the things that they like, and their interests. This gives me insight into who they are and allows me to see the “other side” of their face — what is on the inside. That is what I really attempt to bring out so that the viewer can see a little bit of what I see. Salt Lake City is my home, and I have found it a fascinating place to live. The people who have come from diverse backgrounds and have done unusual things with their lives intrigue me. 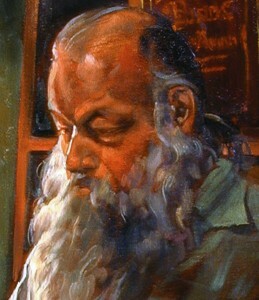 The interesting lives they have led are etched in the features of their faces. 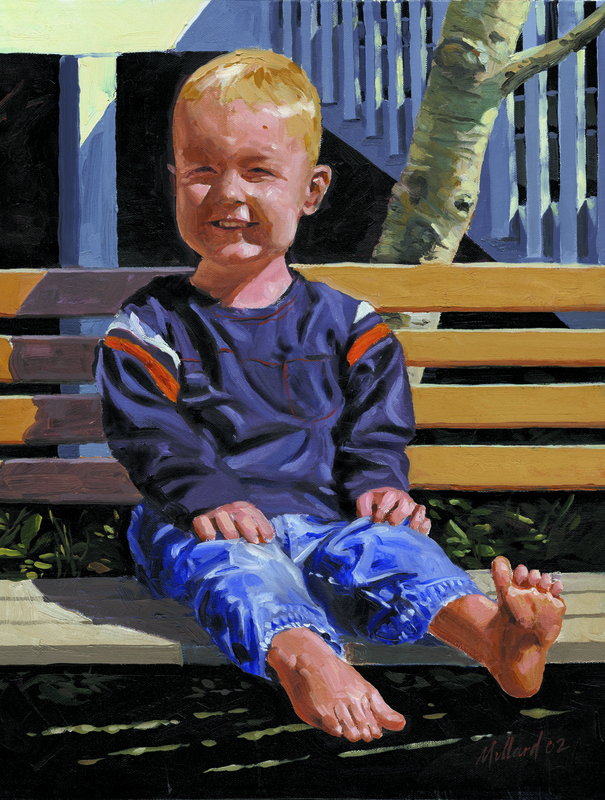 Painting these portraits gives me a chance to memorialize those who helped develop this city. John Bagley is a pilot’s pilot. He began flying in his early teen years and has never stopped. 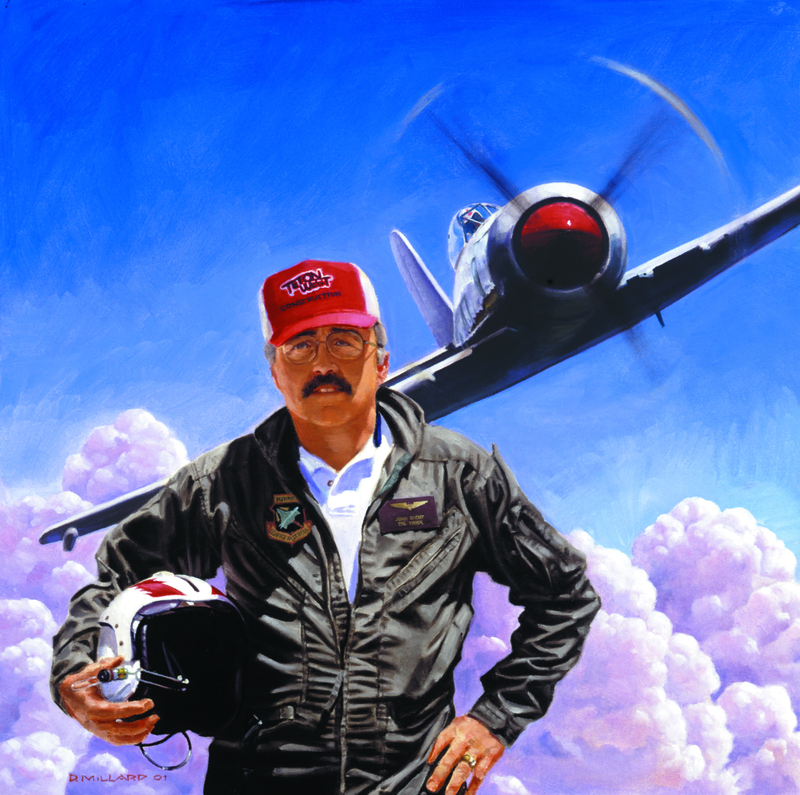 John has become very proficient at flying and is certified in most WW II fighters and is an accomplished aerobatic pilot. Even though he is not from Salt Lake City I felt this story is directly related to the others. I met him through a common friend and visited him in his home in Rexburg where we went to the Rexburg airport to see his collection of planes (www.oleyeller.com). John and I struck up a friendship, and he invited me to the Reno National Championship Air Races where he was a regular participant in the unlimited class. This means he flies against the fastest prop driven planes in the world. Just the kind of thing I like. I went to Reno and took hundreds of photos of John at the race and knew I had to paint him. The airplane he raced at the time was a modified Hawker Sea Fury named “Southern Cross.” The plane was built at the end of WW ll and had been restored to showroom condition. 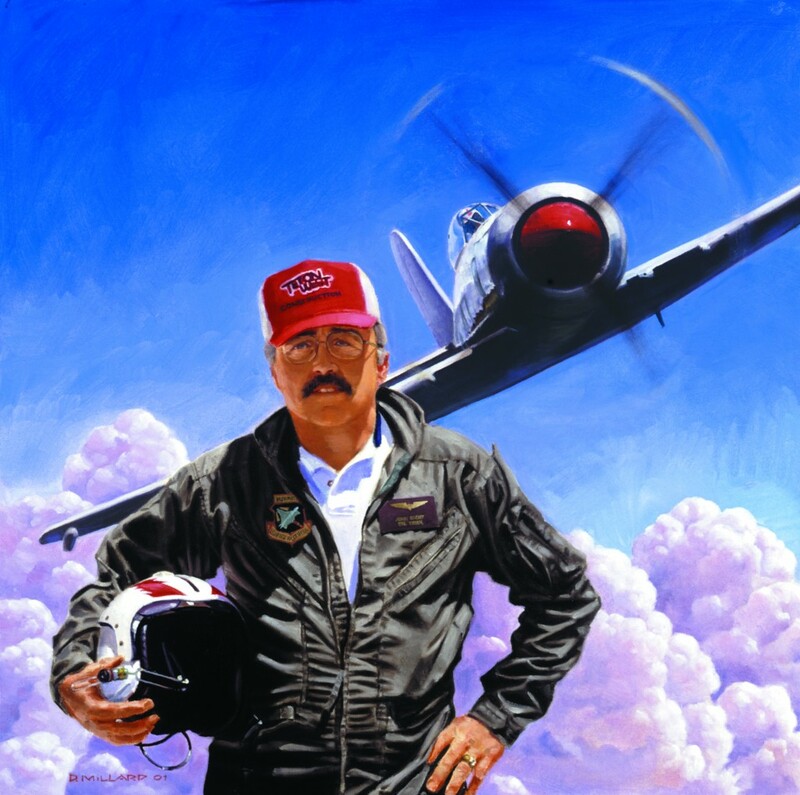 I watched John fly at Reno and was so impressed with the race and with this airplane that I knew that this was the basis for a portrait. I traveled to Rexburg, Idaho, to photograph John. The photo I ended up using was shot during his takeoff. I was actually as close to the runway as you see in the painting and the sound of the 18-cylinder motor at full throttle, passing by within feet, was deafening. Even though he is standing on the ground in the painting (that’s obvious) I didn’t want any reference to the ground, trees, mountains or any landscape at all. This dealt with flying, so I painted clouds to get the feeling of flight. Pete Marshall owns a used bookstore on Main Street in Salt Lake City. 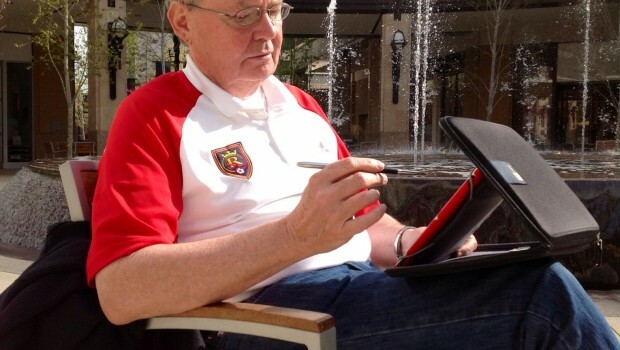 He has been at that location for over 30 years and is a fixture in downtown Salt Lake City. I stop in often to look at used books and other interesting items that Pete has picked up at estate sales and auctions. One afternoon I went into the store and this is what I saw. It was the essence of Pete: the shirt, the surroundings, the counter, the cigarette. It was just so typical Pete Marshall. I had a camera with me, and I told Pete not to move. I took several photographs, maybe 20, of Pete looking one way and then the other. I really didn’t have to do much. That first image I saw when I walked in the door was too perfect. That often happens, it’s almost like a vision. I see the image, I notice the lighting, I see the surroundings and everything just seems to come together. Usually I don’t have to do much to get what I really want. Pete is one of the well-heeled, yet down-to-earth shop owners that bring unusual items to the downtown customer. Steve is my neighbor. I had seen him out working in the yard, walking his dogs, and I just liked the way he looked. He is o typical of the eclectic mix in downtown Salt Lake City. I saw him one day with the sunglasses and liked the effect. 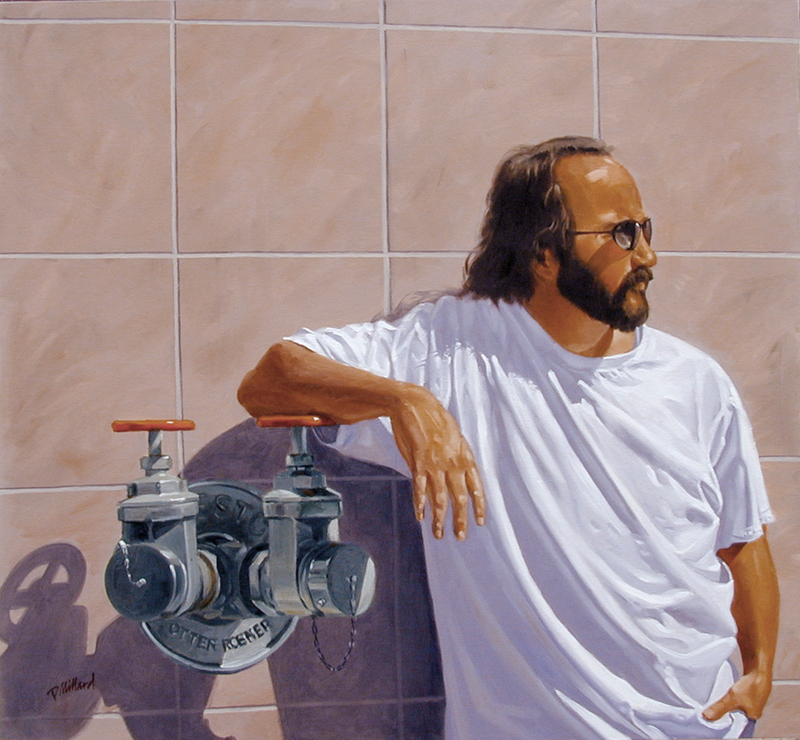 The T-shirt and the sunglasses suited him, and I knew I had to paint the portrait. As I considered the composition, I remembered Steve is an outdoor person. I knew he enjoyed rock climbing and other outdoor sports so painting him out of doors would feel natural both to Steve and to me. I thought about going into the mountains, maybe trees or rocks would be a good setting and that would have worked. But one day while I was downtown I saw a wall on one of the malls and the water outlets with shadows, and I knew that that had to be the place. It was the marriage of the outdoorsman and the city dweller. Dave Strong owns the downtown Porsche/Audi dealership. Strong Porsche has been the premier name for the greatest sports cars in the world in Salt Lake City for over 50 years. I was at the dealership one day talking to his son Blake, who now runs the dealership. Blake mentioned that his father’s birthday was coming up and that it might be fun to present him with a painting as a surprise present. Since it was going to be a surprise party, I knew I would not be able to take photographs. Blake had one photo that his father really liked. 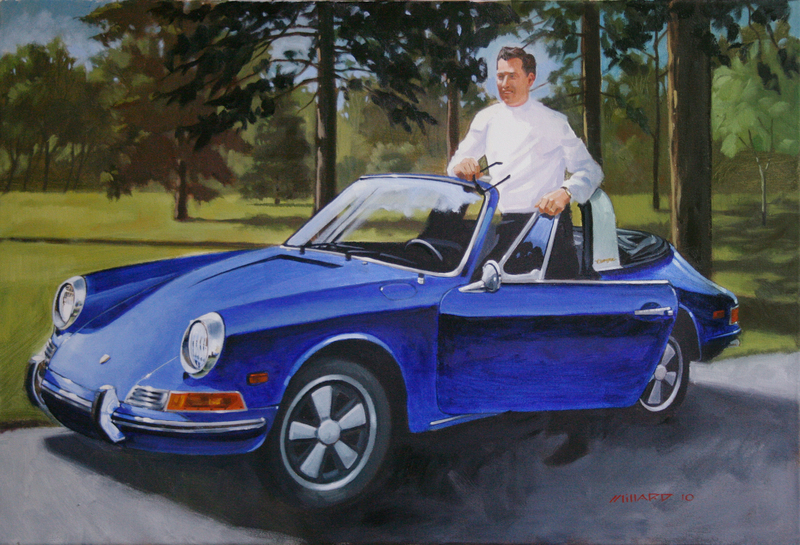 It was of him standing next to his favorite Porsche. The photograph was small and old, the detail faded, and I knew it would be a difficult job. 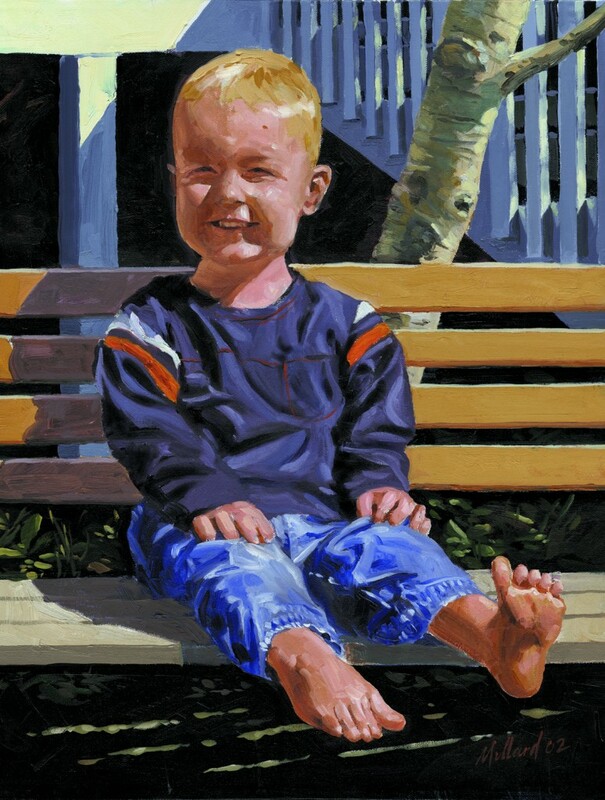 When painting portraits the key goal is to capture an accurate likeness of the sitter. As I worked the vague shapes from the photograph into the details of his face, I fashioned the image of Dave Strong. When it was all said and done, I had a good representation of this iconic businessman standing next to the car of his youth, and it was a great success. On a brisk winter afternoon I was shopping at a bookstore and came across a man who was so striking that I knew he had to be my next portrait. 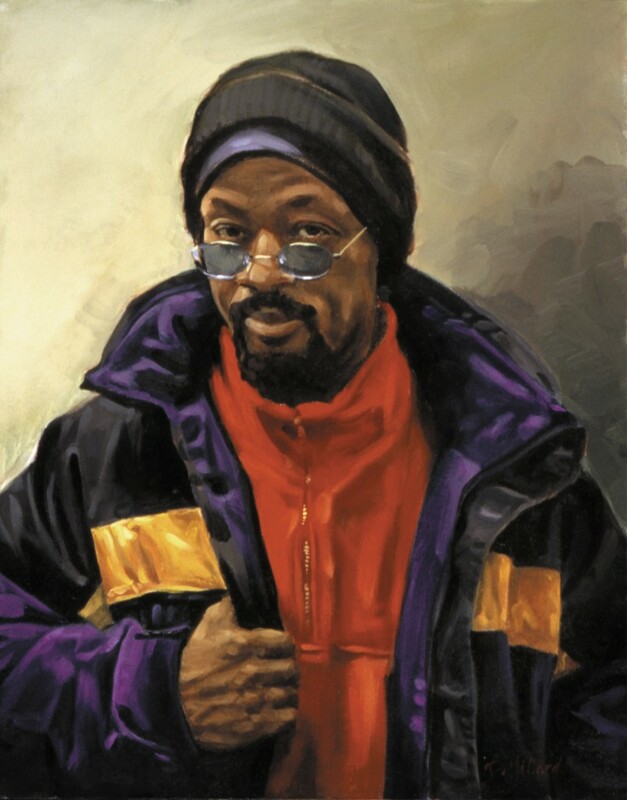 Here was a man who was wearing the brightest colors: red fleece, black jacket, yellow stripes, purple lining, blue glasses. I knew I had to paint this man. I did not know him and followed him around the bookstore for a few minutes. I realized that if I passed up this opportunity I would regret it forever. 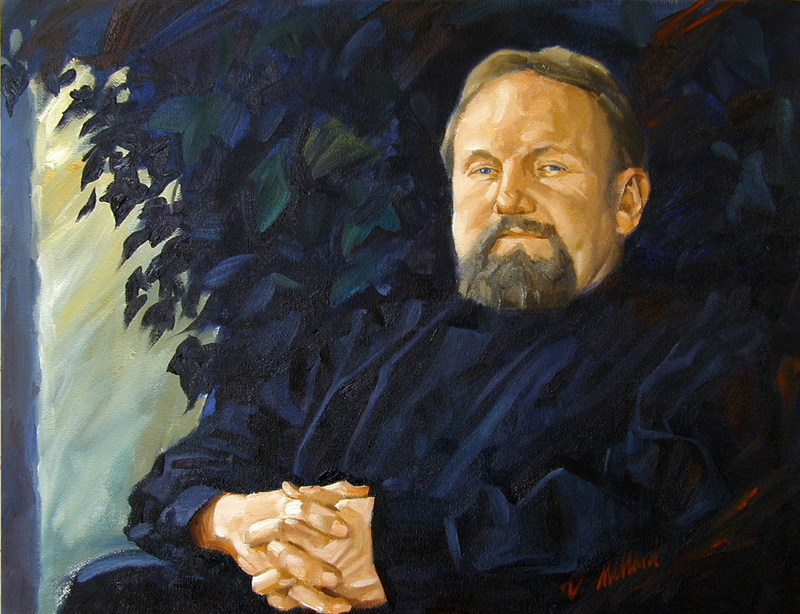 I approached him, handed him my business card and asked if I could do a painting of him. I think he was a little surprised but he was very gracious and agreed to allow me to take some photos. Fortunately, I had my camera in my pocket so I positioned him under a light in the store and took a few photographs. Because of the situation I didn’t take as many photographs as I would have liked. When I went home and downloaded the photos, I realized I had gotten exactly what I wanted. I was so excited that I went to work almost immediately and completed the portrait in two days. KG represents the myriad personalities that live in Salt Lake. 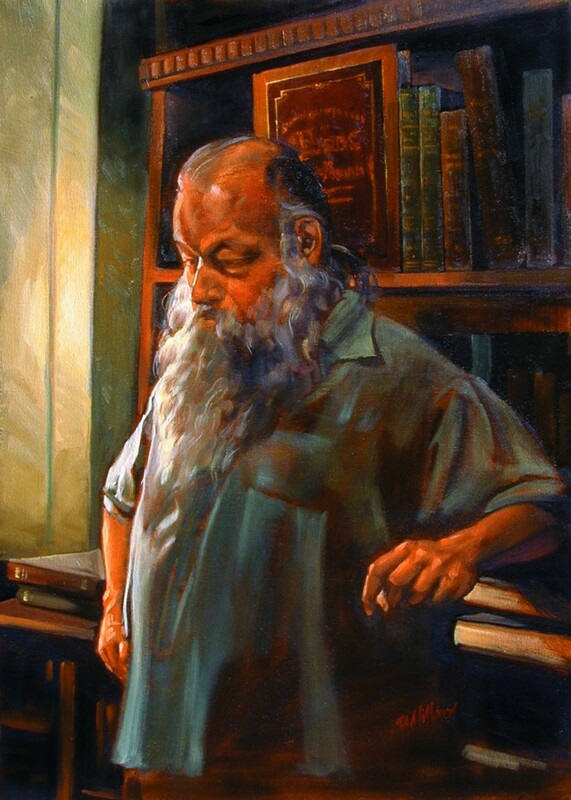 Ken Sanders owns Ken Sanders Rare Books, which specializes in works on Utah and the Mormons; the exploration and discovery of the American West with emphasis on the Grand Canyon and the Colorado River; and Yellowstone and other national parks and wilderness areas. 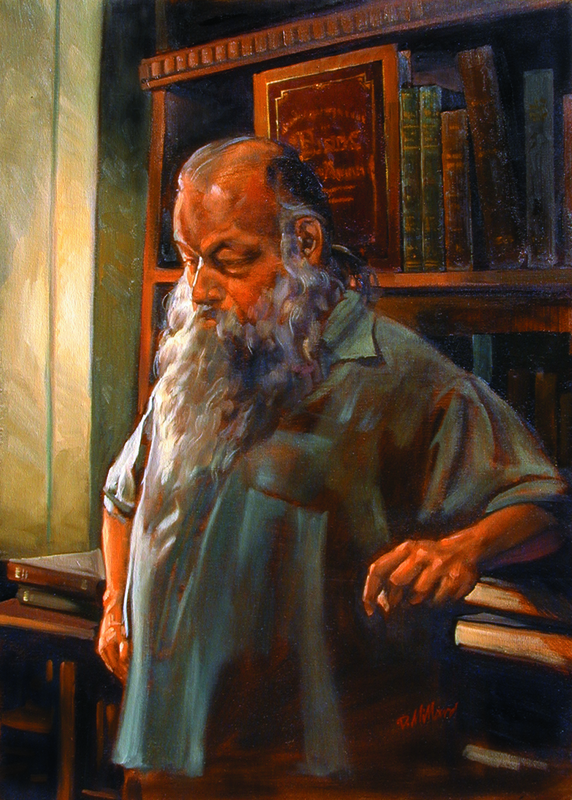 Ken has been in the rare-book business in Salt Lake City since the 1970s. I got to know Ken when I would go to his store to look for a certain book or to get information about a special book, like the one about a German poster artist named Ludwig Holwein. Somewhere along the way I decided that Ken had an image that would make a great portrait. I told him what I wanted to do and he agreed. As I studied the store and looked for something that would serve as a good background, I realized that Ken looked natural anywhere in the store. I realized it wasn’t the background; it was Ken. I asked him to pick out one or two of his favorite books. 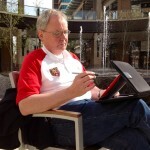 As he contemplated that request and was deep in thought, I shot the photo that became the portrait. The lighting was right, his countenance was right, his gesture was right. Everything just came together so I took a few shots and I had my painting. I am not sure that he even knew I was taking photographs; he was so lost in thought and that was the perfect situation for me. Warren is a good friend, a neighbor, a sculptor and a painter. 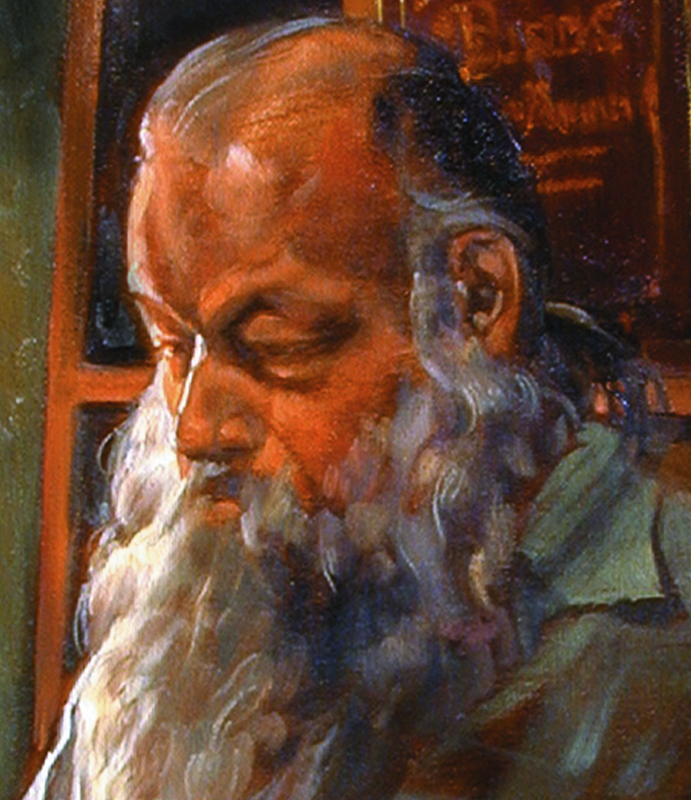 His sculptures are seen in galleries and private collections throughout the country. I went to his house one afternoon and found him sitting on his front porch working on a piece of sculpture and again I had a vision. He was in a dark turtleneck and was surrounded by ivy. I knew that the warm skin tones against the dark, cool background would create some very nice contrasts. This is the result. Sometimes the answers are very simple. 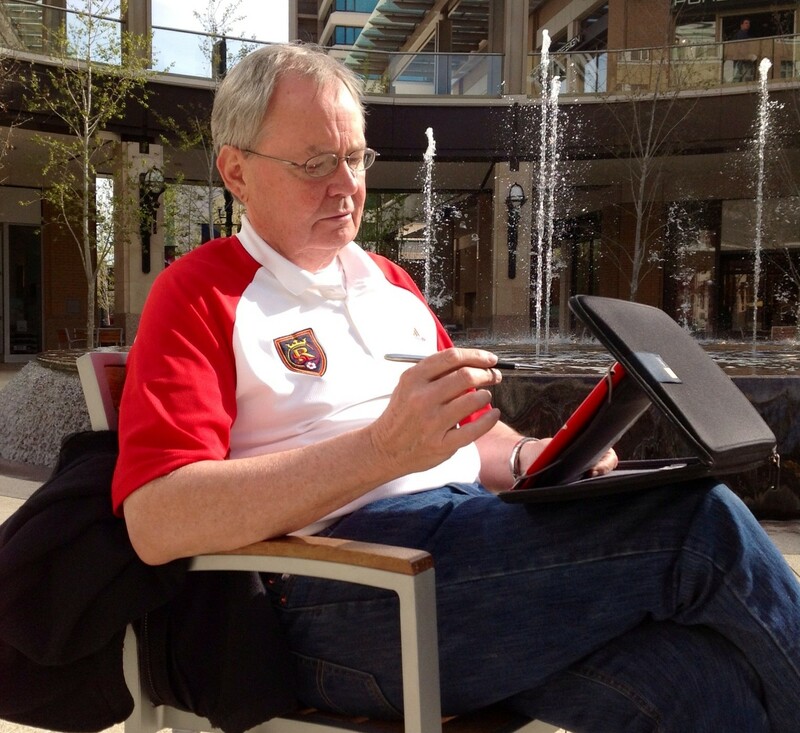 Warren is representative of a thriving art community in downtown Salt Lake City. I got to know Don Hale by going into his Big H drive-in and having lunch. Don started Hires Big-H in 1959. It serves hamburgers, root beer and carhops. Whenever I ate there, he was always working and reminded me of my grandfather. 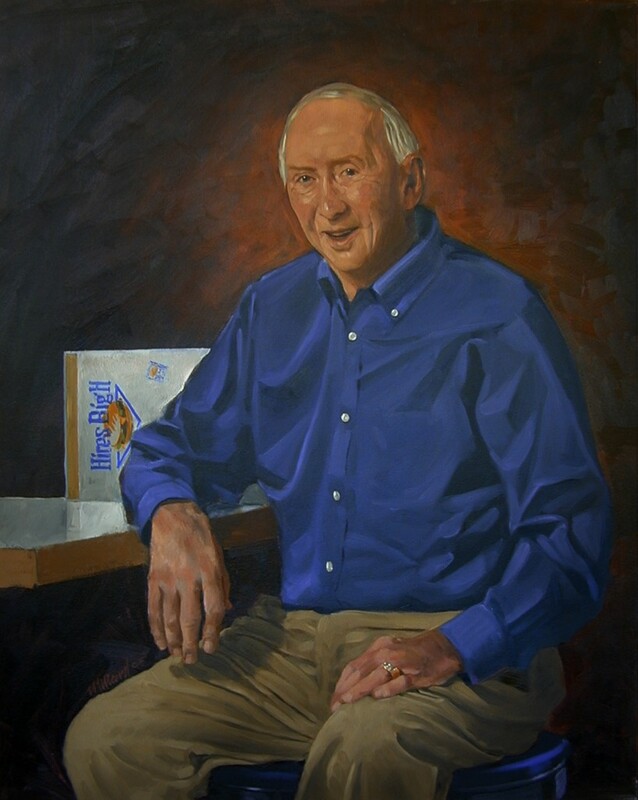 Since I never had an opportunity to paint a portrait of my grandfather, who worked in the family doughnut shop into his early 90s, I thought this would be a great chance to make up the loss. Don and I discussed a lot of things: hamburgers, his homemade chili and the restaurant business. He even gave me a copy of his published biography. When I approached Don about painting his portrait I told him that it would be for my portfolio and that it would be a great benefit to me. He was a gentleman, and I couldn’t have asked for a better, kinder subject. This restaurant entrepreneur passed away at the age of 93. Obsession does not adequately describe Terry Nish’s love of racing. He is the owner of several businesses but his main drive is Nish Motorsports. Nish Motorsports is the entity that champions this beautiful 30-foot streamliner at the Bonneville Salt Flats. 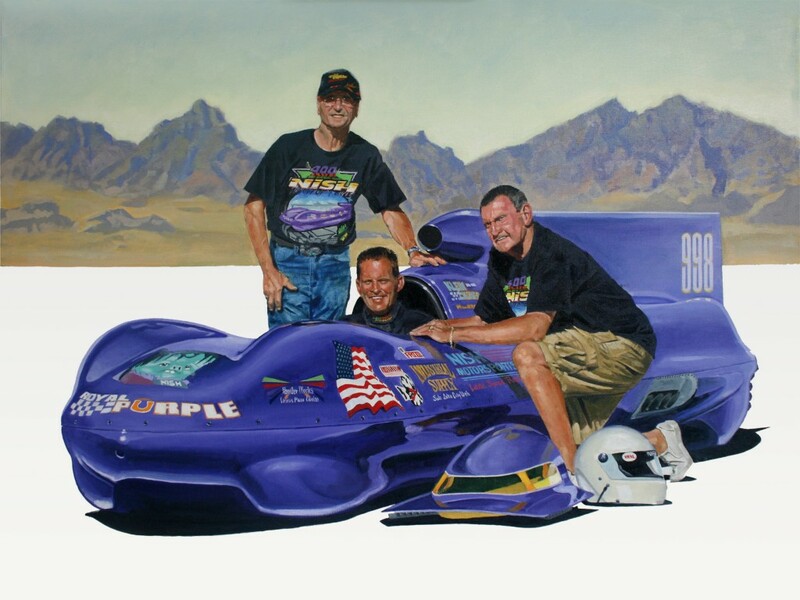 Terry and his sons hold many speed records (412+ mph). In fact, the Nishes are known as the fastest family on the planet. One of my friends introduced me to Terry, and when I went to his shop and saw this magnificent car that was hand-built I just knew that there was a portrait in there somewhere. 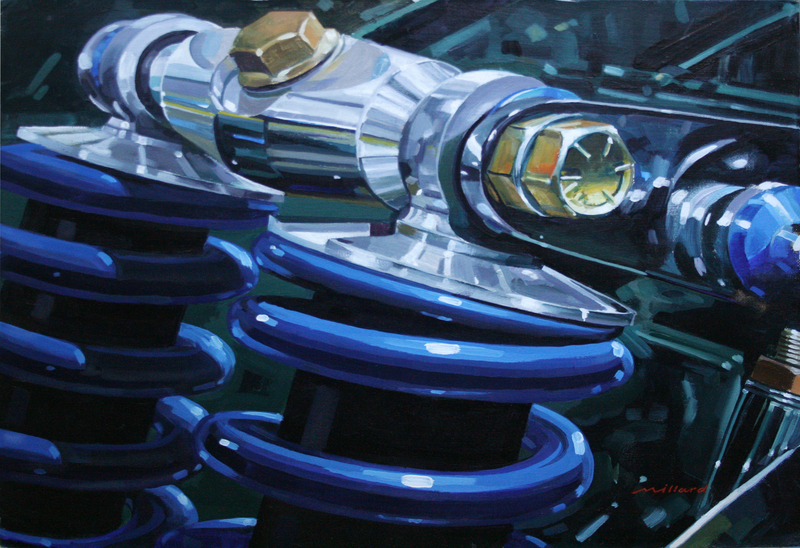 I did some paintings of just the car, and even did paintings of parts of the engine. But it seemed to me that those paintings were incomplete without the people. Terry agreed and we pulled his car out of the shop into the parking lot. I got his chief mechanic, Cecil McCray, his son Mike, who now drives the car, and Terry to pose with the car. I then drove to the Salt Flats and spent the day getting what I needed for the background. It ended up being a large painting because of the three people, the car and all those sponsor decals (I hadn’t realized those decals would be so much work.) I wasn’t happy with the mountains when I finished so I ended up repainting them three times to get them the way I wanted. In the end I was happy with the portrait, and Terry was very pleased. Joe Timmons is the owner of Harley of Salt Lake. He has raised money for worthy events through sponsored rides all over the west. 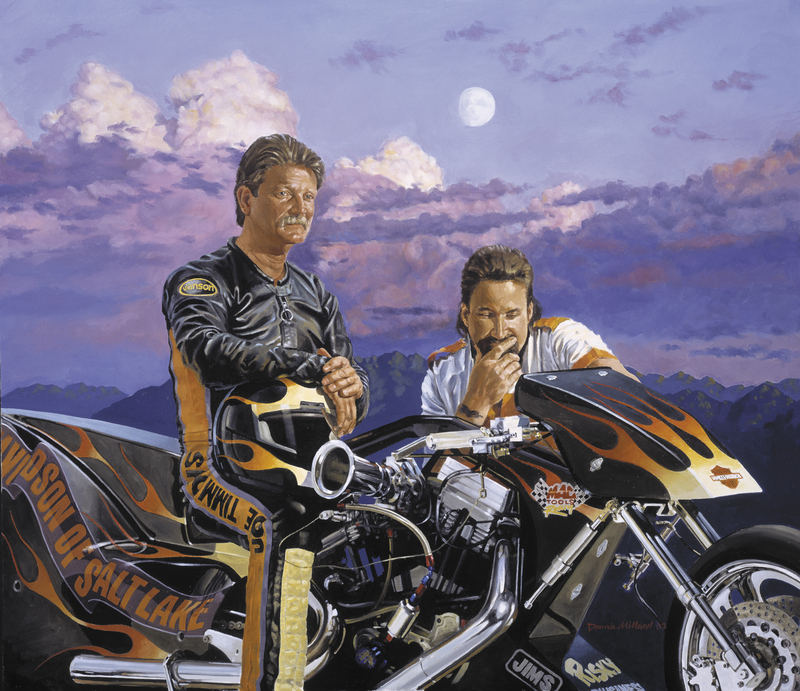 Even though he has an immaculate dealership full of Harley Davidson motorcycles, he is best known for his efforts on the dragstrip. Joe built and races a drag bike called “Risky Business” capable of reaching well over 200 miles an hour in the quarter mile. 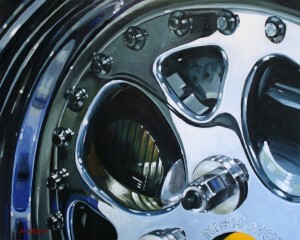 I am attracted to anything with wheels and a motor, and when I saw this motorcycle I just had to do a painting. It seemed natural to include his chief mechanic, Mike. 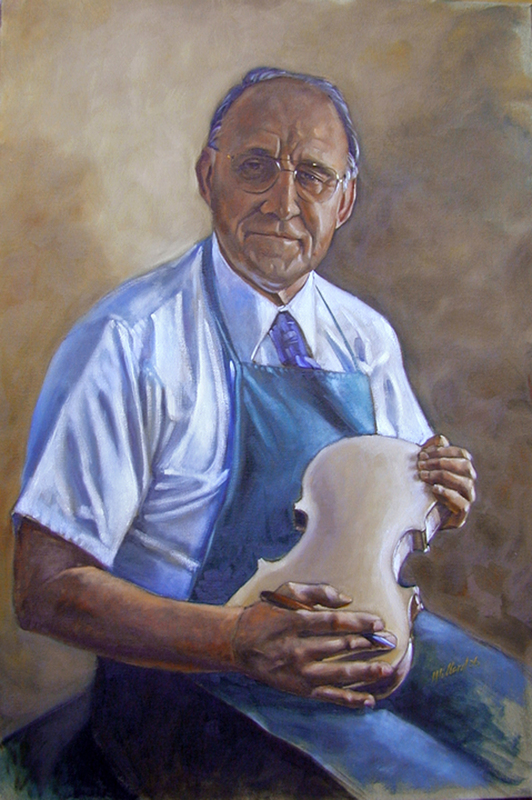 Peter Paul Prier is the founder of the Violin Making School (1972) and Bow Making School (1998) of America. He immigrated from Germany in 1960 to work under Ludwig Aschauer at Pearce Music Company in Salt Lake. Peter represents the many immigrants who have contributed to this community. 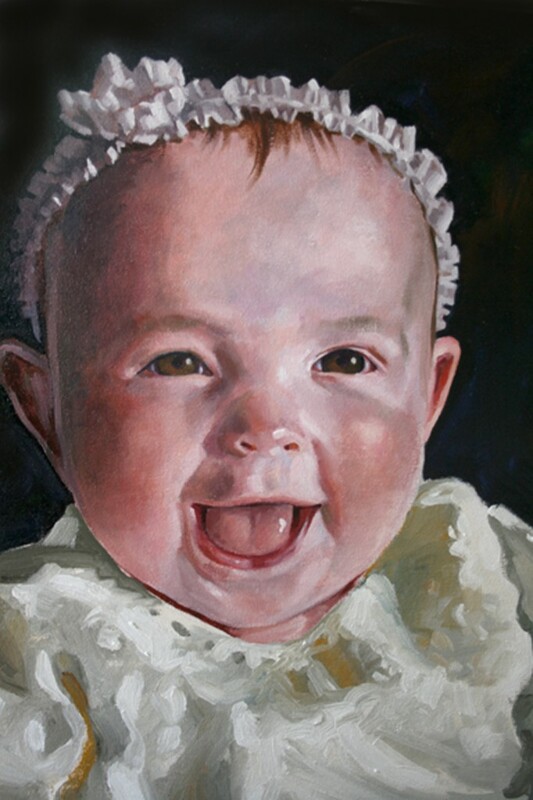 Painting children is a delight and must always be done from photos for obvious reasons. I happened to see Taylor playing in his front yard as I was coming home one day. I rushed home, picked up my camera and took a few photos from which I did this painting. I was fortunate to get him to sit still for 125th of a second. These paintings are very special to me. They are my grandchildren and because I have 13 of them I have only included two (I hope I don’t get in trouble for that) in order to save space. When I painted Elliot I felt impressed to keep it loose and fresh so the background is unfinished and you can see the drawing on the shirt. I felt that gives the painting a spontaneity that I really like and reflects Elliott. The differences in personalities are very noticeable and so fun to try to capture.